Compatibility: 1st, 2nd, 3rd generation, and the E Nest Learning Thermostat. Contact us if you would like to exchange the plate for a darker or lighter shade choice. THE BETTER WALL PLATE: Complete the simple design of the Nest Thermostat with an elegant bamboo back plate. BEAUTIFUL: Invite nature in for a balanced harmony in your home. Edge grain strands of bamboo flows gracefully with the baseboard. RESPONSIBLE & SUSTAINABLE: Bamboo - the ultimate versatile renewable material. Our bamboo is carefully sourced only from FSC Certified producers. 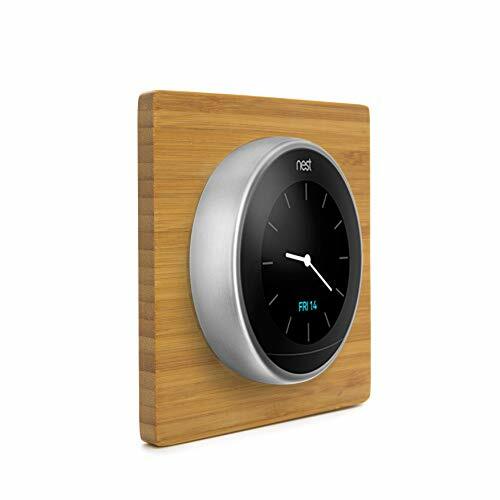 FUNCTIONAL: Compatible with the 1st, 2nd, 3rd generation, and the E Nest Learning Thermostat. Covering an area of 4.4 x 4.4 inches. ★ LOVE IT OR YOUR MONEY BACK ★ Each home is unique and adding something permanent to your interior design can be stressful. After receiving this back plate, our customers have the option to exchange or return the item. Natural bamboo varies considerably in shade from light to dark. Contact us if you would like to exchange the plate for a darker or lighter shade choice. If you have any questions about this product by IE Works, contact us by completing and submitting the form below. If you are looking for a specif part number, please include it with your message.